The Camry has been amongst Toyota's most successful sedans in the world for quite a while now. However, with an ever-increasing shift towards sustainable mobility and the consequent shunning of diesel taking place across the western hemisphere, Toyota has reintroduced the Camry in its hybrid version in Europe after an absence of more than 14 years. 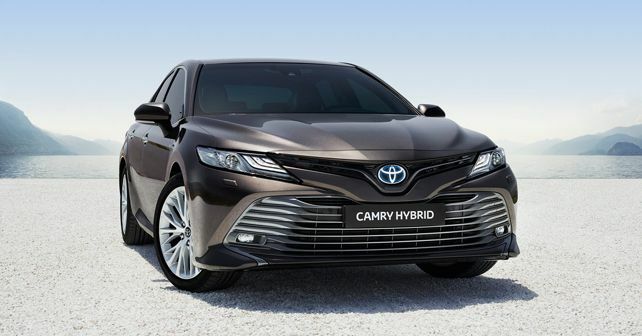 In its new iteration, the Camry Hybrid is powered by an entirely new 2.5-litre ‘self-charging’ hybrid setup which consists of a four-cylinder petrol engine working in tandem with an electric motor that produces a combined power output of 215bhp. All this power is sent to the front wheels through a 6-speed CVT automatic gearbox, which comes equipped with Sequential Shiftmatic Technology (ability to simulate six gears). With Dual VVT-i and D-4S tech on offer, the new Camry, as per Toyota, has a claimed fuel-efficiency figure of 23.8 km/l. The interior of the new Camry features an 8-inch touchscreen infotainment system, complemented by a 10-inch heads-up display and a 7-inch multi-information display. With a choice between leather and fabric upholstery, the interior is available in two colour schemes with variations of beige and black. The deliveries of the new Camry in Europe are likely to begin by early 2019. The Camry's fate in India has been a mixed bag due to the FAME scheme's inability to take off and its subsequent withdrawal by the Indian government. The scheme's withdrawal led to the hybrid Camry costing more than its petrol and diesel derivatives, which further lowered its demand. Consequently, Toyota had to shut down Camry's production in October last year. However, with CAFE (Corporate Average Fuel Efficiency) norms set to roll out in India from 2022, hybrids could potentially get a new lease of life under these norms, as carmakers are expected to launch more hybrids and EVs along with conventionally powered cars to achieve the required average fuel efficiency targets across their product portfolios. Interestingly, Toyota is only bringing hybrid models of its vehicles to this year's Paris Motor Show, which include the Yaris, Corolla, the RAV4 and the Camry.